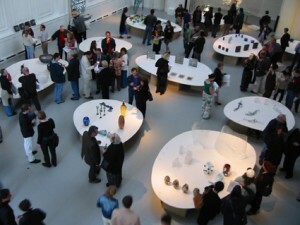 In 2002 the 32nd conference of the http://www.glassart.org/ was held in Amsterdam. It was the first time this organisation held their conference in Europe. The GAS is an international non-profit organization founded in 1971 whose purpose is to encourage excellence, to advance education, to promote the appreciation and development of the glass arts, and to support the worldwide community of artists who work with glass. We aimed to show all these international visitors the state-of-the-art glass of all European countries in just one exhibition: Young and Hot, Emerging European Glass Artists. To accomplish that, we contacted the most renowned art schools or glass schools for their recommendations and selected three to five of their students or recent graduates. Everything was exhibited in an old church in the middle of Amsterdam, now called Societeit Baby. The opening of the exhibition doubled as the opening of the GAS conference. The GAS conference is only three days, but because most visitors came from the USA, all the events lasted longer. Young and Hot was just one of many events throughout The Netherlands specifically made for the GAS conference. Durk Valkema and Arnoud Odding were managing directors for the GAS in Amsterdam, the ‘island-like’ design was made by Bart Guldemond.